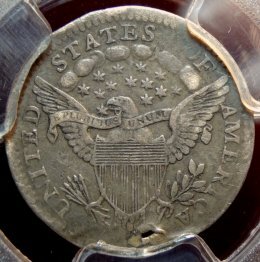 1797 U.S. Half Dime Variety: 16 Stars VF-25 (PCGS)... Small Eagle Reverse: Very scarce to rare in all grades above Fine-12 or better. 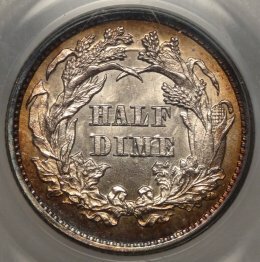 A very rare original and fully detailed Very Fine 25, Problem free, check with the PCGS population report, possibly around 50 total circulated examples exist (there is no way to know how many of these have been resubmitted) so the population is certain to be less. 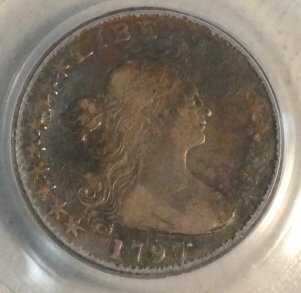 Our senior numistatist believes he has only seen a handful of high end circs. for sale during his 55 years on the job. Perfect for Type. 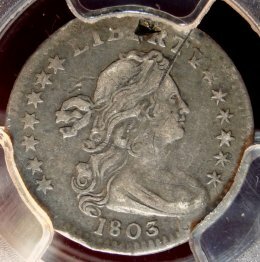 1803 U.S. Draped Bust Half Dime Genuine VF Details (PCGS)...Variety: Small 8 Exceedingly RARE! Only 10-15 specimens known! 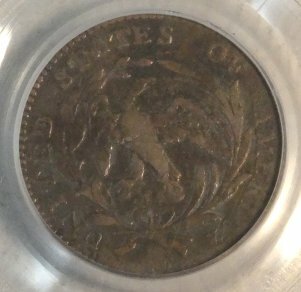 1862 U.S. 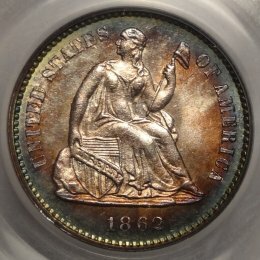 Seated Liberty Half Dime MS64 (PCGS)...A gorgeous un-molested original civil war era coin.